Situated 12 km south west of Cahersiveen, Skellig Michael is renowned for its early Christian Monastic architecture (6th Century). The Small Skellig is host to 23,000 pairs of Gannets as well as many other wild bird species. View of Skellig Michael View from Skellig Michael Boat trips to the skelligs can be arranged during the spring and summer (weather permitting). 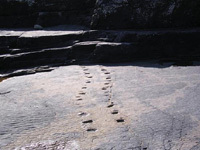 The footprints of a tetrapod dating back 385 million years were discovered on Valentia Island in 1997 and featured in National Geographic. There are also subtropical gardens as well as a museum on the first transatlantic cable which was laid between Valentia and Newfoundland in 1862. The area is rich in Archaeological sites - e.g. Stone Forts, Standing Stones, Dolmens and Megalitic Tombs. Two ring forts, Lecanabuaile and Cahergal can be found beside Cahersiveen. The Skellig Islands are only a few miles away and the Valentia Tetrapod Footsteps are only 15 mns away. 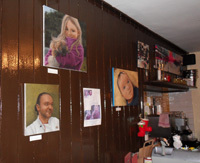 A variety of handmade crafts are available locally - Paintings, Pottery, Ceramics, Bog Oak, Sculptures, Stone Work etc.. Breathtaking scenery combined with peace and tranquility makes this area an artist's paradise. South West Kerry has breathtaking scenery, with over 100 miles of rugged Atlantic coastline and many safe sandy beaches, 3 of them classified as blue flag beaches.